Among the thousands of caves in the Carpathians Mountains, only a few had such a rich past in events as the Woman Cave (Pestera Muierii) from Baia de Fier had. Situated in a wild place, having more than just one entrance, the Woman Cave was a natural fortress, a resistance point for the inhabitants of the neighboring settlements over their struggling history. One of the entrances offers an excellent observation point over the field from the South and another entrance opens the view to the dense forests of the Parang Mountains. 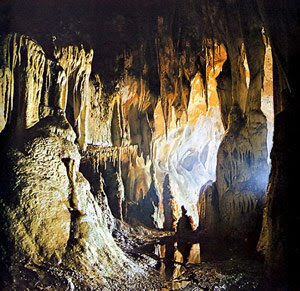 The electrification established between 1963 and 1978 changed the cave in the most popular and visited speleological objective from Romania. 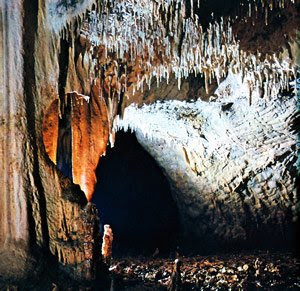 Even if, what the dimension, the beauty and the quality of the arrangement are concerned nowadays, the Woman Cave, with an aggregate length of galleries of over 3,500 m, was surpassed long time ago, it continues to be the headline of the Romanian speleotourism, being visited by thousands of visitors every year. Situated nearby, but at higher levels of karsti-fication, are also other caves of smaller dimensions, such as the Corbului Cave, Parcalabului Cave and Iedului Cave known under the name of the Baia de Fier Caverns. It seems that the first written record about the Woman Cave dates back to 1870, when the archaeological Al. Odobescu mentioned it in an archaeological questionnaire. Since then, in over 100 years of researches, an important and varied scientific and documentary material has been collected , attesting to valuable archaeological, paleonthological, geomorphologic, as well as biospelaeological and mineralogical finds. These form together over 95 % of the 3,566 m aggregate length of the cave galleries. For practical reason and because of the superposed location of the galleries, we call them the upper and lower storey. The general north-south orientation of the whole system of galleries runs along the fissure which allowed the waters of the Galbenul River stream to dig them in the rocks. You may enter the cave through three different points, a northern, eastern and southern mouth. The last two entrances are the places of resurgence of the waters of the former underground stream which once flowed through the northern slope. Nowadays the Galbenul stream has abandoned its underground course and the karstification process is continued only by the percolation waters provided by rainfalls or snow melts. On entering the cave through its northern gate, at about 130 m within you find yourself in front of the Small Dome-shaped stalagmite from which widens on your left the Altar Chamber, rich in concretions with a ceiling ending in a 17 m high swallow hole. Walking in the same direction, a gallery with numerous boulders lying on the floor leads to the eastern mouth, called the Altar Gate, which opens into the abrupt slope of the Galbenul Gorge. The main gallery, known as the Electrically-lit Gallery, continues southwards and gets more and more spectacular because of its numerous ceiling concretions and basins, sometimes filled with water, in the portions, called the Small Basins and the Large Basins. Two hundred and seventy meters farther you enter the Turk’s Chamber, one of the most beautiful parts of the upper floor. Huge stalagmites, domes, wall and ceiling concretions taking the strangest shapes are known as Father Christmas, the Turk, the Turk’s wife, etc. Passing through a narrow corridor and over a threshold by climbing a metal ladder, you enter the so-called Chamber of Wonders, because of its numerous microbasins and candle-shaped stalactites and stalagmites, which adorn it. On coming back to the main gallery you will walk on through the Small Gate, a portion where the walls and ceiling draw very near, leaving only a small passage and you will enter the Guano Chamber. On the eastern wall make out a whole network of galleries, a real place of refuge for the cave fauna, since it is less accessible to visitors, and not yet electrified. From the Guano Chamber on there is only a 40 m’ s distance to daylight, passing through the southern gate, which opens, into the slope facing the largely terraced meadow. The lower floor, divided into two sectors by alluvial silting, is of particular scientific interest. For this reason it was declared Speleological Reserve in 1955 and the Woman Cave, aMonument of Natural Reserve. The northern sector, made up of a network of labyrinthine galleries totals a length of 1,650 m. you may enter it through a narrow connecting gallery, opened in the western slope of the upper floor at about 30 m within from the northern entrance. After crawling along a short portion and going down a 2 m deep step you reach a small chamber from whose north-western corner an 18 m deep swallow-hole takes you to the Electrician’s Gallery. It is rather difficult to describe this sector of the cave owing to the cross-connexions of its galleries. Nevertheless you may make out a western system with the Electrician’s Gallery as a main chamber, and an eastern system with the Excentric’s and Basin Galleries as principal rooms. They are characterized by a high degree of alluvial silting and the presence of potholes of different depths varying between 10 and 15 m, as well as an exceptional variety of concretions. They reach a climax in the Red Chamber of daylight, a rare mineral species found in caves, made up of calcium phosphocarbonate and taking all the known shapes in calcite: stalagmites, stalactites, curtains, wall and floor concretions, rimstone pools, etc. The Bears’ Gallery was named thus because of its numerous skeleton remains of the Quaternary fossils of mamalia, belonging mostly to cave bears. Its great variety and numerous calcite concretions make it quite remarkable. Its walls are also adorned with corrosion hieroglyphs, leopard skins, wall plates and spoons. The Pearl Chamber has a low ceiling, in some places under I’m, and displays a lovely folded curtain right at its entrance, known as the Bride’s Veil. The floor looks mosaic-shaped on account of its many crystals and contains numerous cave pearls. If, instead of going down the first metal ladder towards the southern sector, you would go left and climb a 2.5 m-high step, you would reach the so-called Mousterian Gallery. It is the place where archaeologists found evidence that the cave was inhabited by man in Middle and Higher Paleolithic times. The first one says that, long time ago, when men used to dominate everything and to go defend the land against the invaders, women used to take in haste the children and old people into the cave , which was know at that time only them (women). There they used to stay until the battles were over. The second version says that this name-the Woman Cave would derive from the fact that in the days dominated by draught in summer, the women used to sit in front of the mouth of the cave and spin the wool. The air that came out of the cave used to facilitate the work of spinning the thread. Others affirm that the women used to even go inside the cave, where they used to melt the flax and the hemp.